Summary Business-focused five-bay Atom D525 ZFS based NAS supporting folder level deduplication and encryption. Network Storage is one of the last places that networking product manufacturers can make a buck. Margins are still relatively decent—compared to wireless routers, at least—and if you have something unique to offer, buyers will pay a relatively high price. Taiwan-based Infortrend has been around since 1993, starting out making RAID controllers, moved on to RAID subsystems and today is best known for its Fibre Channel and SAS, SAN and DAS enterprise-grade storage solutions. Infortrend starting making rackmount NASes in 2010, but apparently couldn't resist the siren call of the lower-end desktop NAS market. So in July, it announced it was bringing its EonNAS Pro desktop line to the U.S. and asked us if we would like to take a look. The EonNAS Pro line comes in two, five and eight bay models. 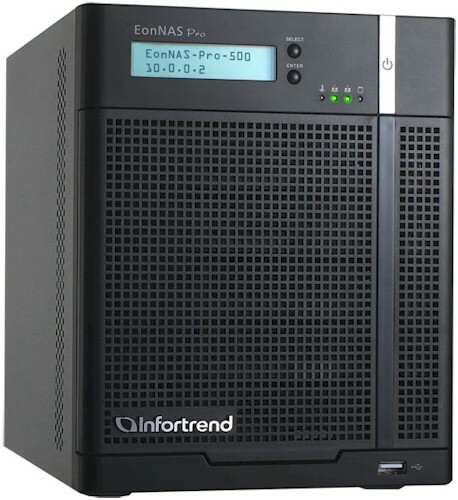 We'll be looking at the five-bay EonNAS Pro 500. The Pro 500 is housed in a sturdy metal chassis. Only the front cover and bezel trim are plastic and match the black painted metal cover. Five drives sit behind an unlockable door, in plastic and metal trays that are screwdriver lockable. Front panel features are shown in the diagram below. The blue-background LCD screen provides a selection of status information and access to some settings that you get to using the Select and Enter buttons. We used the screen mainly to check the IP address that the NAS grabbed from my LAN DHCP server and little else. Rear panel features are shown below. All USB ports are USB 2.0. You can ignore the expansion host port and serial port callouts; those features are not supported on this model. The VGA port is active and allowed logging in using the default admin account and password (admin/admin). But all the Linux commands we entered from the USB keyboard also attached threw an Unknown Command. Please type help for information error. One bit of helpful information that was displayed was the SunOS 5.11 OS identification. This makes sense, since EonNAS Pros all use the ZFS filesystem internally, which was developed by Sun Microsystems and lives on in various OSes. It was easy to get inside the Pro 500 by simply removing the cover. But we had to abandon getting the main board out for a photo due to the plethora of cables running to it. You might think from the rear panel diagram above that the board was easily slid out by removing a single screw, but that's not the case at all. The photo below is a bit blurry, but we think you can see what we mean about the cables. Everything, including the drive bay connectors, attaches to the main board via cables, even the 1 GB USB flash DOM you see at the photo upper right. Given the cables and multiple boards, this is not a NAS that seems designed for low manufacturing cost. We suspect that Infortrend doesn't manufacture the board, but instead OEMs it. The key components are summarized in Table 1. The fact that the Pro 500 uses an older dual-core Intel D525 Atom instead of the more current D2700 isn't a biggie. We haven't really seen much difference in performance between NASes using each platform. The 4 GB of RAM should get big RAM fans excited since it's unusual to see in this class of NAS. We suspect the extra RAM is in there to try to help boost ZFS performance, as indicated in this interesting article. But, as you'll see in the Performance section, all that RAM didn't seem to have its intended effect for some of the benchmarks. Power consumption measured 45W with four WD Red 3 TB (WD30EFRX) drives we supplied spun up and a relatively high 30W when the programmable drive spindown kicked in. Fan noise with the system idling was very noticeable in my quiet home office setting. Noise increased significantly when the system was working while running our benchmark tests. So, since you probably plan on using a NAS when you buy it, we rate the Pro 500's noise level at medium high. It is definitely not something you would want in a place where you expect your NAS to be seen and not heard.